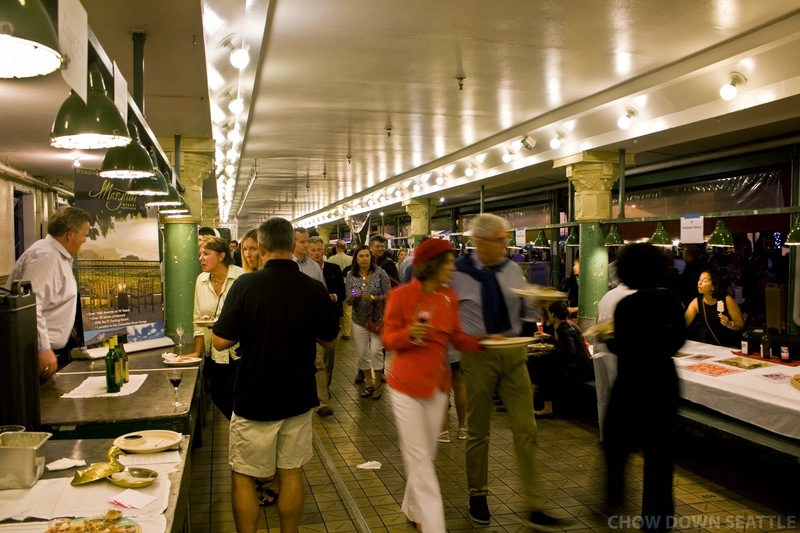 Friday night The Pike Place Market Foundation hosted the Sunset Supper at Pike Place Market. It is one of the largest events of the year to raise money for the Market Foundation. The Sunset Supper featured some of the best Chefs, restaurants, wineries, distilleries and breweries the Seattle area has to offer! 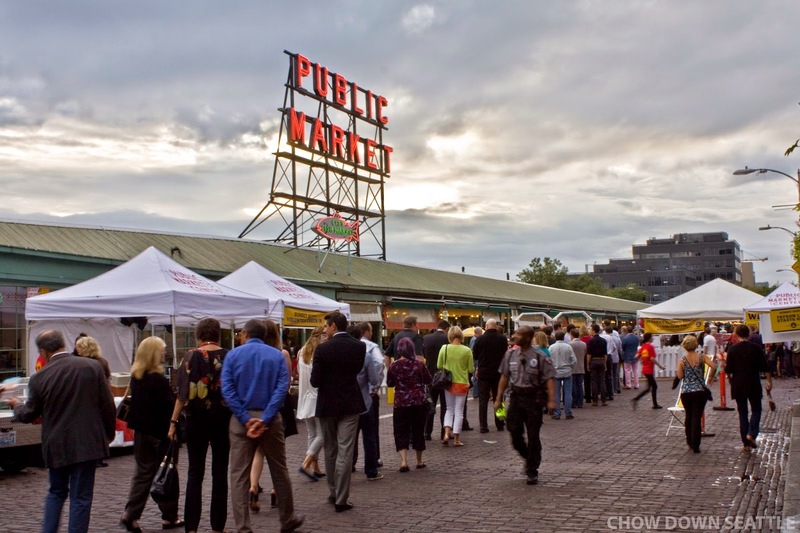 It doesn't get any better in Seattle than savoring great food and drinks throughout a warm, summer evening at one of the city's most popular landmarks! Even before the event started, there was already a long line of people waiting to enter the Market so they could start enjoying the great food and drinks that awaited them. 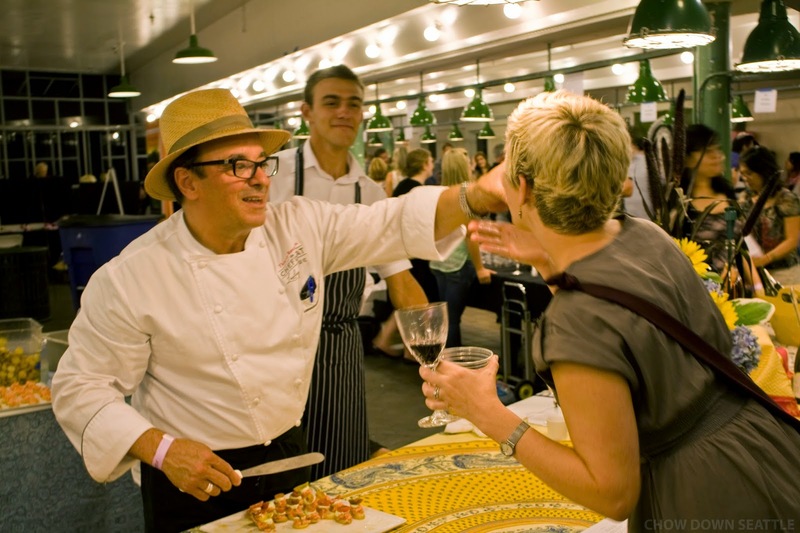 The Sunset Supper featured a lot of great Chefs including Seattle's own Thierry Rautureau, The Chef in the Hat! Thierry is well-known for his two popular restaurants, Luc and Loulay. Thierry has appeared on Bravo's "Top Chef Masters", and is also the co-host of "Seattle Kitchen" on KIRO Radio. Thierry is one of my favorite Chefs. He always takes delight in preparing delicious food he knows people will enjoy. Throughout the evening, I had the pleasure of sampling a lot of great food, wines and liquor. Below is a slide show of some of the amazing food and drinks offered by the vendors at the Sunset Supper. From the start of the event, the Market was full of energy with attendees sampling the delicious offerings from all the vendors. Not only was everyone treated to great food and drinks, but the live entertainment was great too! 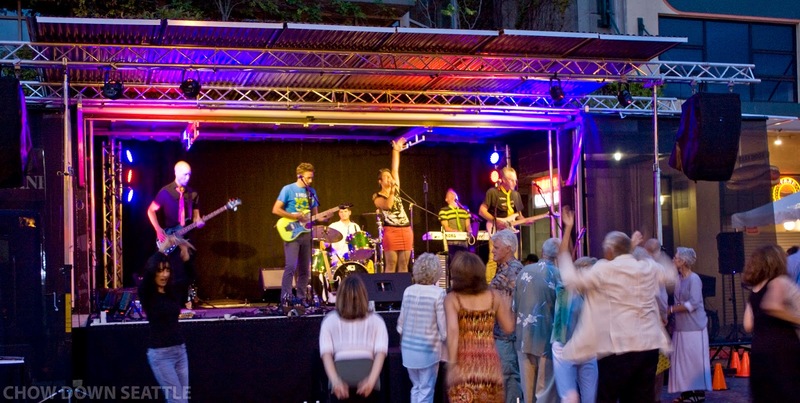 The band played through the evening entertaining the crowd as they danced through the night. The Sunset Supper at Pike Place Market would not be complete without a beautiful sunset! Earlier in the day, it almost looked as if the weather would not cooperate, but it turned out to be a beautiful evening. 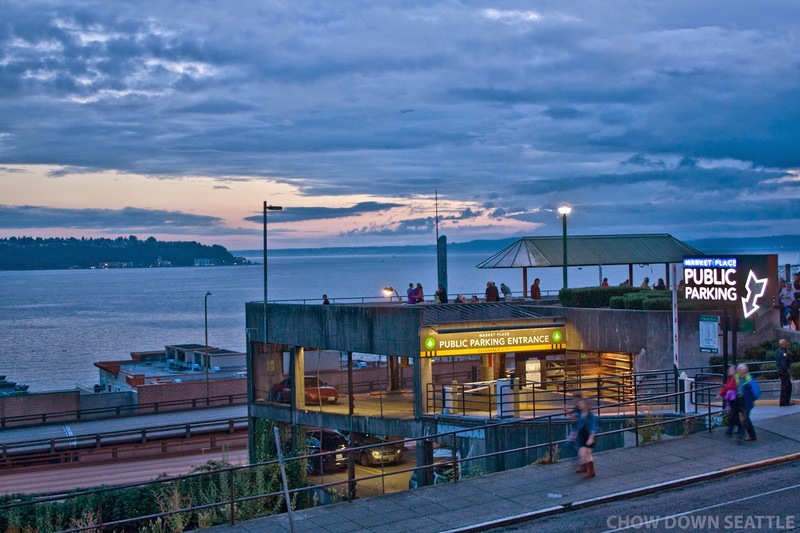 Proceeds from the Sunset Support go to The Pike Place Market Foundation, which is the heart of the Market. The Foundation helps the Market we all love remain a thriving, caring community. The Foundation was established in 1982. It is a non-profit organization which supports housing and services for low-income neighbors. They provide a food bank to feed the hungry; a preschool available to low-income families; a medical clinic offering care for homeless, low-income, and elderly clients; and Heritage House that offers assisted living to seniors. The Market is planning to expand Westward! The viaduct will be coming down soon, and the Market will be expanding West to offer space for more vendors and access to the waterfront. This is a very ambitious project, but the benefits to the Market, downtown and the waterfront will be huge. 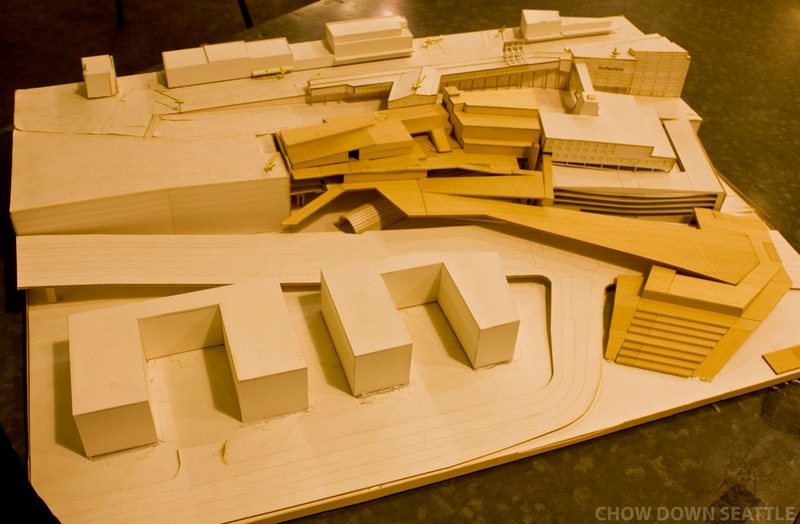 The Waterfront Entrance to Pike Place Market will expand upon the heart of what The Market Foundation does in the community. You can help the Market realize its dream by making a donation today! 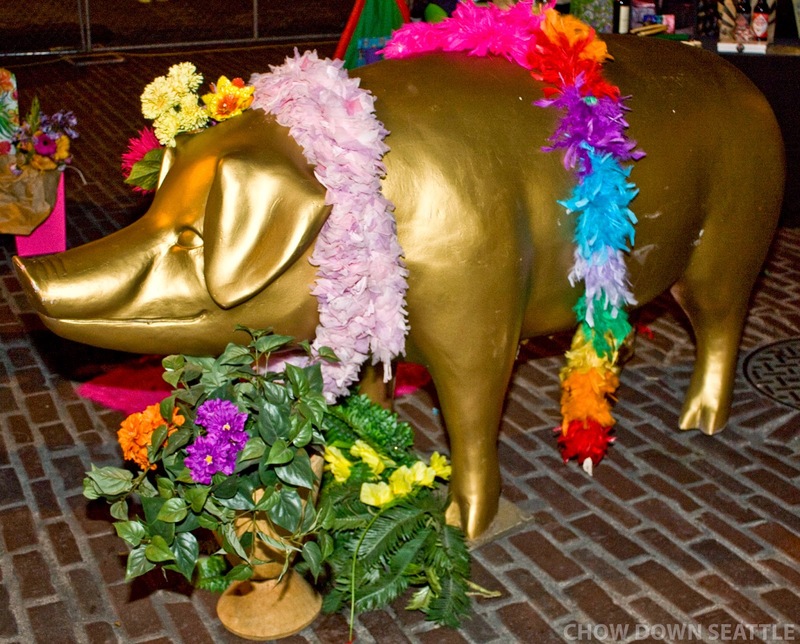 Even Rachel the Piggy Bank was all dressed up for the Sunset Supper! 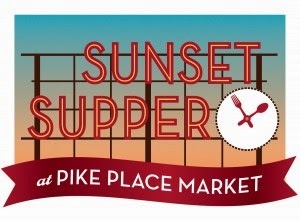 The Sunset Supper at Pike Place Market was truly a great evening of food, drinks and entertainment. The event allowed some of the best Chefs, restaurants, wineries, distilleries and breweries to highlight what they have to offer. It was also a great event to raise awareness of The Market Foundation and what it does to keep the Market a thriving and caring community. This was by far the best food event I have attended this year, and I look forward to attending next year! Be sure to check out The Market Foundation's website to get the latest news on their future events, and to learn more about what the Market has to offer. Won't the new waterfront be great? The Sunset Supper looks fun, I'll think about it for next year. I love Thierry Ratureau too, enjoyed his presentation at IFBC! I love this place. Regardless of the time of your event, you always get the same thing from the party planner: reasonable drink prices, great decoration, & friendly staff.